Hamburg ( [ˈhambʊɐ̯k], local pronunciation [ˈhambʊɪ̯ç]; Low German/Low Saxon: Hamborg [ˈhambɔːç]), officially the Free and Hanseatic City of Hamburg (German: Freie und Hansestadt Hamburg) is the second largest city and a state of Germany, with a population of over 1.7 million people. The official name reflects Hamburg's history as a member of the medieval Hanseatic League, a free imperial city of the Holy Roman Empire, a city-state, and one of the 16 states of Germany. Before the 1871 Unification of Germany, it was a fully sovereign state. Prior to the constitutional changes in 1919, the civic republic was ruled by a class of hereditary grand burghers or Hanseaten. Though repeatedly destroyed by the Great Fire of Hamburg, the floods, and military conflicts including WW2 bombing raids, the city managed to recover and emerge wealthier after each catastrophe. On the river Elbe, Hamburg is a major port and a global service, media, logistics and industrial hub, with headquarters and facilities of Airbus, Blohm + Voss, Aurubis, Beiersdorf, and Unilever. The radio and television broadcaster NDR, Gruner + Jahr (Europe's largest printing and publishing firm), Der Spiegel and Die Zeit are also based in Hamburg. Hamburg has been an important financial centre for centuries and is the seat of Germany's oldest stock exchange and the world's second oldest bank, Berenberg Bank. With the International Tribunal for the Law of the Sea, the EU-LAC Foundation, the UNESCO Institute of Lifelong Learning, many consular and diplomatic missions, and various international conferences like Hamburg Summit: China meets Europe and the 2017 G20 Hamburg summit, the city is also a factor in world politics and international law. The city is a tourist destination for both domestic and international visitors, ranked 18th in the world for livability in 2016. Speicherstadt and Kontorhausviertel were declared a World Heritage Site by UNESCO in 2015. Hamburg is a major European science, research, and education hub, with several universities and institutes. Its creative industries and cultural sites include the Elbphilharmonie and Laeisz concert halls, art venues, music producers, and artists. It gave birth to movements like Hamburger Schule and paved the way for bands including The Beatles. Hamburg is also known for several theatres and a variety of musical shows. St. Pauli's Reeperbahn is among the best known European entertainment districts. 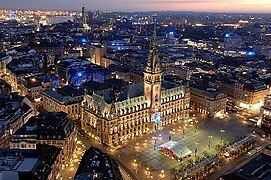 Hamburg is on the southern point of the Jutland Peninsula, between Continental Europe to the south and Scandinavia to the north, with the North Sea to the west and the Baltic Sea to the north-east. It is on the River Elbe at its confluence with the Alster and Bille. The city centre is around the Binnenalster ("Inner Alster") and Außenalster ("Outer Alster"), both formed by damming the River Alster to create lakes. The islands of Neuwerk, Scharhörn and Nigehörn, 100 kilometres (60 mi) away in the Hamburg Wadden Sea National Park, are also part of the city of Hamburg. The neighbourhoods of Neuenfelde, Cranz, Francop and Finkenwerder are part of the Altes Land (old land) region, the largest contiguous fruit-producing region in Central Europe. Neugraben-Fischbek has Hamburg's highest elevation, the Hasselbrack at 116.2 metres (381 ft) AMSL. Hamburg borders the states of Schleswig-Holstein and Lower Saxony. In 1189, by imperial charter, Frederick I "Barbarossa" granted Hamburg the status of an Imperial Free City and tax-free access up the Lower Elbe into the North Sea. In 1265, an allegedly forged letter was presented to or by the Rath of Hamburg. This charter, along with Hamburg's proximity to the main trade routes of the North Sea and Baltic Sea, quickly made it a major port in Northern Europe. Its trade alliance with Lübeck in 1241 marks the origin and core of the powerful Hanseatic League of trading cities. On 8 November 1266, a contract between Henry III and Hamburg's traders allowed them to establish a hanse in London. This was the first time in history that the word hanse was used for the trading guild of the Hanseatic League. In 1270, the solicitor of the senate of Hamburg, Jordan von Boitzenburg, wrote the first description of civil, criminal and procedural law for a city in Germany in the German language, the Ordeelbook (Ordeel: sentence). On 10 August 1410, civil unrest forced a compromise (German: Rezeß, literally meaning: withdrawal). This is considered the first constitution of Hamburg. In 1529, the city embraced Lutheranism, and it received Reformed refugees from the Netherlands and France. In the Third Reich (1933–1945), Hamburg was a Gau from 1934 until 1945. During the Second World War, Hamburg suffered a series of Allied air raids which devastated much of the city and the harbour. On 23 July 1943, RAF firebombing created a firestorm which spread from the Hauptbahnhof (main railway station) and quickly moved south-east, completely destroying entire boroughs such as Hammerbrook, Billbrook and Hamm South. Thousands of people perished in these densely populated working class boroughs. While some of the boroughs destroyed were rebuilt as residential districts after the war, others such as Hammerbrook are nowadays purely commercial districts with almost no residential population. The raids, codenamed Operation Gomorrah by the RAF, killed at least 42,600 civilians; the precise number is not known. About one million civilians were evacuated in the aftermath of the raids. At least 42,900 people are thought to have perished in the Neuengamme concentration camp (about 25 km (16 mi) outside the city in the marshlands), mostly from epidemics and in the bombing of Kriegsmarine evacuation vessels by the Royal Air Force at the end of the war. Hamburg surrendered without a fight to British Forces on 3 May 1945. After the Second World War, Hamburg formed part of the British Zone of Occupation; it became a state of the then Federal Republic of Germany in 1949. From 1960 to 1962, the Beatles launched their career by playing in various music clubs in the city. On 16 February 1962, a North Sea flood caused the Elbe to rise to an all-time high, inundating one-fifth of Hamburg and killing more than 300 people. There were 915,319 women and 945,440 men in Hamburg. For every 1,000 males, there were 1,033 females. In 2015, there were 19,768 births in Hamburg (of which 38.3% were to unmarried women); 6422 marriages and 3190 divorces, and 17,565 deaths. In the city, the population was spread out with 16.1% under the age of 18, and 18.3% were 65 years of age or older. 356 People in Hamburg were over the age of 100. According to the Statistical Office of the State of Hamburg, the number of people with a migrant background is at 34% (631,246). Immigrants come from 180 different countries. 5891 people have acquired German cititzenship in 2016. In late 2015, 27.0% of the population belonged to the North Elbian Evangelical Lutheran Church, the largest religious body, and 10.7% to the Roman Catholic Church. According to the publication "Muslimisches Leben in Deutschland" estimated 141,900 Muslim migrants (counting in nearly 50 countries of origin) lived in Hamburg in 2008. About three years later (May 2011) calculations based on census data for 21 countries of origin resulted in the number of about 143,200 Muslim migrants in Hamburg, making up 8,4 percent of the population. Hamburg has architecturally significant buildings in a wide range of styles and only a few skyscrapers. Churches are important landmarks, such as St Nicholas', which for a short time in the 19th century was the world's tallest building. The skyline features the tall spires of the most important churches (Hauptkirchen) St Michael's (nicknamed "Michel"), St Peter's, St James's (St. Jacobi) and St. Catherine's covered with copper plates, and the Heinrich-Hertz-Turm, the radio and television tower (no longer publicly accessible). The many streams, rivers and canals are crossed by some 2,500 bridges, more than London, Amsterdam and Venice put together. Hamburg has more bridges inside its city limits than any other city in the world and more canals than Amsterdam and Venice combined. The Köhlbrandbrücke, Freihafen Elbbrücken, and Lombardsbrücke and Kennedybrücke dividing Binnenalster from Aussenalster are important roadways. The lavish and spacious Planten un Blomen park (Low German dialect for "plants and flowers") located in the centre of Hamburg is the green heart of the city. Within the park you can find various thematic gardens, the biggest Japanese garden in Germany and The Alter Botanischer Garten Hamburg which is a historic botanical garden, that now consists primarily of greenhouses. The Botanischer Garten Hamburg is a modern botanical garden maintained by the University of Hamburg. Besides these, there are many more big and small parks. In 2010 Hamburg was voted "greenest city of Europe" by the EU commission. In 2014 Hamburg celebrated a birthday of park culture, where many parks were reconstructed and cleaned up. Moreover, every year there are the famous water-light-concerts in the Planten un Blomen park from May to early October. Hamburg has several large museums and galleries showing classical and contemporary art, for example the Kunsthalle Hamburg with its contemporary art gallery (Galerie der Gegenwart), the Museum for Art and Industry (Museum für Kunst und Gewerbe) and the Deichtorhallen/House of Photography. The Internationales Maritimes Museum Hamburg opened in the HafenCity quarter in 2008. There are various specialised museums in Hamburg, such as the Archaeological Museum Hamburg (Archäologisches Museum Hamburg) in Hamburg-Harburg, the Museum of Labour (Museum der Arbeit), and several museums of local history, for example the Kiekeberg Open Air Museum (Freilichtmuseum am Kiekeberg). Two museum ships near Landungsbrücken bear witness to the freight ship (Cap San Diego) and cargo sailing ship era (Rickmer Rickmers). The world's largest model railway museum Miniatur Wunderland with 15.4 km (9.57 mi) total railway length is also situated near Landungsbrücken in a former warehouse. Hamburg State Opera is a leading opera company. Its orchestra is the Philharmoniker Hamburg. The city's other well-known orchestra is the NDR Elbphilharmonie Orchestra. The main concert venue is the Laeiszhalle, Musikhalle Hamburg, pending completion of the new Elbe Philharmonic Hall. The Laeiszhalle also houses a third orchestra, the Hamburger Symphoniker. György Ligeti and Alfred Schnittke taught at the Hochschule für Musik und Theater Hamburg. Hamburg is noted for several festivals and regular events. Some of them are street festivals, such as the gay pride Hamburg Pride festival or the Alster fair, held at the Binnenalster. The Hamburger DOM is northern Germany's biggest fun fair, held three times a year. Hafengeburtstag is a funfair to honour the birthday of the port of Hamburg with a party and a ship parade. The biker's service in Saint Michael's Church attracts tens of thousands of bikers. Christmas markets in December are held at the Hamburg Rathaus square, among other places. The long night of museums offers one entrance fee for about 40 museums until midnight. The sixth Festival of Cultures was held in September 2008, celebrating multi-cultural life. The Filmfest Hamburg — a film festival originating from the 1950s Film Days (German: Film Tage) — presents a wide range of films. The Hamburg Messe and Congress offers a venue for trade shows, such hanseboot, an international boat show, or Du und deine Welt, a large consumer products show. Regular sports events—some open to pro and amateur participants—are the cycling competition EuroEyes Cyclassics, the Hamburg Marathon, the biggest marathon in Germany after Berlin, the tennis tournament Hamburg Masters and equestrian events like the Deutsches Derby. Since 2007, Hamburg has the Dockville music and art festival. It takes place every year in summer in Wilhelmsburg. There is the curious regional dessert pastry called Franzbrötchen. Looking rather like a flattened croissant, it is similar in preparation but includes a cinnamon and sugar filling, often with raisins or brown sugar streusel. The name may also reflect to the roll's croissant-like appearance – franz appears to be a shortening of französisch, meaning "French", which would make a Franzbrötchen a "French roll." Ordinary bread rolls tend to be oval-shaped and of the French bread variety. The local name is Schrippe (scored lengthways) for the oval kind and, for the round kind, Rundstück ("round piece" rather than mainstream German Brötchen, diminutive form of Brot "bread"), a relative of Denmark's rundstykke. In fact, while by no means identical, the cuisines of Hamburg and Denmark, especially of Copenhagen, have a lot in common. This also includes a predilection for open-faced sandwiches of all sorts, especially topped with cold-smoked or pickled fish. There are restaurants which offer most of these dishes, especially in the HafenCity, which started being built in 2008 with 155 hectares (380 acres) and 13 quarters. This district increases the city centre by about 40%, with restaurants and apartments. There are several English-speaking communities, such as Caledonian Society of Hamburg, The British Club Hamburg, British and Commonwealth Luncheon Club, Anglo-German Club e.V., Professional Women's Forum, The British Decorative and Fine Arts Society, The English Speaking Union of the Commonwealth, The Scottish Country Dancers of Hamburg. There is also a thriving 400-year-old Anglican church community worshiping at St Thomas Becket Church. Further The Hamburg Players e. V. English Language Theatre Group, The Hamburg Exiles Rugby Club, Several cricket clubs, The Morris Minor Register of Hamburg. Furthermore, the Anglo-Hanseatic Lodge No. 850 within the Grand Lodge of British Freemasons of Germany under the United Grand Lodges of Germany works in Hamburg, and has a diverse expat membership. A tribute to the British is that for German's extremely popular 18 minutes short intimate play "Dinner For One - The 90th Birthday". It was casted 1963 as a live act for TV in english language at NDR-Hamburg studios with Freddie Frinton and May Warden. The funny story is about a wealthy british lady, her buttler and four pretended guests celebrating her 90th birthday. The 2007 gross domestic product (GDP) totaled €85.9 billion. The city has a relatively high employment rate, at 88 percent of the working-age population, employed in over 120,000 businesses.The average income of employees was €30,937. The most significant economic unit is the Port of Hamburg, which ranks second to Rotterdam in Europe and ninth worldwide with transshipments of 9.8 million twenty-foot equivalent units (TEU) of cargo and 134 million tons of goods in 2007. 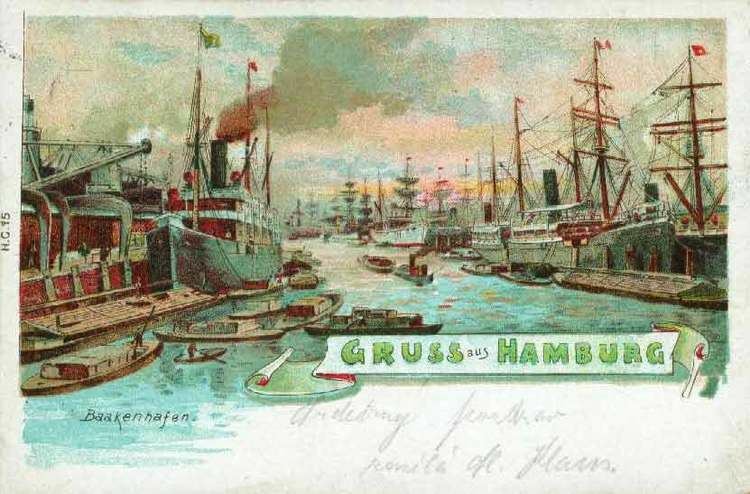 After German reunification, Hamburg recovered the eastern portion of its hinterland, becoming by far the fastest-growing port in Europe. International trade is also the reason for the large number of consulates in the city. Although situated 68 miles (110 km) up the Elbe, it is considered a sea port due to its ability to handle large ocean-going vessels. In 2007, more than 3,985,105 visitors with 7,402,423 overnight stays visited the city. The tourism sector employs more than 175,000 people full-time and brings in revenue of almost €9 billion, making the tourism industry a major economic force in the Hamburg Metropolitan Region. 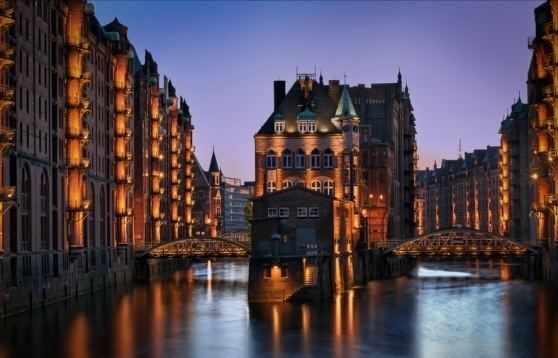 Hamburg has one of the fastest-growing tourism industries in Germany. From 2001 to 2007, the overnight stays in the city increased by 55.2% (Berlin +52.7%, Mecklenburg-Vorpommern +33%). Ten mass transit rail lines across the city are the backbone of public transport. The S-Bahn (heavy railway system) comprises six lines and the U-Bahn four lines – U-Bahn is short for Untergrundbahn (underground railway). Approximately 41 km (25 mi) of 101 km (63 mi) of the U-Bahn is underground; most is on embankments or viaduct or at ground level. Older residents still speak of the system as Hochbahn (elevated railway), also because the operating company of the subway is the Hamburger Hochbahn. The AKN railway connects satellite towns in Schleswig-Holstein to the city. On some routes regional trains of Germany's major railway company Deutsche Bahn AG and the regional metronom trains may be used with an HVV ticket. Except at the four bigger stations of the city, Hauptbahnhof, Dammtor, Altona and Harburg regional trains do not stop inside the city. The tram system was opened in 1866 and shut down in 1978. The international airport at Hamburg Fuhlsbüttel, official name "Hamburg Airport Helmut Schmidt" (IATA: HAM, ICAO: EDDH) is the fifth biggest and oldest airport in Germany, having been established in 1912 and located about 5 miles (8 kilometres) from the city centre. About 60 airlines provide service to 125 destination airports, including some long distance destinations like Newark, New Jersey on United Airlines, Dubai on Emirates, and Tehran on Iran Air; Lufthansa is the hub carrier, with the most flights, followed by Air Berlin, and Lufthansa operates one of its biggest maintenance facilities at the Hamburg airport. The second airport is located in Hamburg-Finkenwerder, official name Hamburg Finkenwerder Airport (IATA: XFW, ICAO: EDHI). It is about 10 km (6 mi) from the city centre and is a nonpublic airport for the Airbus plant. It is the second biggest Airbus plant, after Toulouse, and the third biggest aviation manufacturing plant after Seattle and Toulouse; the plant houses the final assembly lines for A318, A319, A320, A321 and A380 aircraft. Electricity for Hamburg and Northern Germany is largely provided by Vattenfall Europe, formerly the state-owned Hamburgische Electricitäts-Werke. Vattenfall Europe used to operate the Brunsbüttel Nuclear Power Plant and Krümmel Nuclear Power Plant, both taken out of service as part of the nuclear power phase-out. In addition, E.ON operates the Brokdorf Nuclear Power Plant near Hamburg. There are also the coal-fired Wedel, Tiefstack and Moorburg Power Stations, and the fuel-cell power plant in the HafenCity quarter. VERA Klärschlammverbrennung uses the biosolids of the Hamburg wastewater treatment plant; the Pumpspeicherwerk Geesthacht is a pump storage power plant and a solid waste combustion power station is Müllverwertung Borsigstraße. Hamburger SV is a football team in the Bundesliga. The HSV is the oldest team of the Bundesliga, playing in the league since its beginning in 1963. HSV is a six-time German champion, a three-time German cup winner and triumphed in the European Cup in 1983, and has played in the group stages of the Champions League twice: in 2000/2001 and in 2006/2007. They play at the Volksparkstadion (average attendance in the 12/13 season was 52,916). In addition, FC St. Pauli was a second division football club that came in second place in the 2009/2010 season and qualified to play alongside Hamburger SV in the first division for the first time since the 2001–02 season. St. Pauli's home games take place at the Millerntor-Stadion. HSV Handball represented Hamburg until 2016 in the German handball league. In 2007, HSV Handball won the European Cupwinners Cup. The Club won the league in the 2010/11 season and had an average attandence of 10.690 in the O2 World Hamburg the same year. The most recent success for the team was the EHF Champions League win in 2013. Since 2014 the club has suffered from economic problems and was almost not allowed the playing licence for the 2014–15 season. But due to economic support from the former club president/sponsor Andreas Rudolf the club was allowed the licence in the last minute. On 20 January 2016 however, their licence was removed due to violations following the continued economic struggles. In 2016–17 they are not allowed to play in the first or second league. Hamburg was applying for 2024 Olympic Games. However 51.7 percent of those participating in the referendum (only Hamburg's residents) in November 2015 had decided against continuing Hamburg's bid to host the 2024 Olympics. Meanwhile, Hamburg's partner city Kiel voted in favour of hosting the event, with almost 66 percent of all participants supporting the bid. Opponents of the bid had argued that hosting the 33rd Olympic Games would cost the city too much in public funds. Seventeen universities are located in Hamburg, with about 70,000 university students in total, including 9,000 resident aliens. Six universities are public, including the largest, the University of Hamburg (Universität Hamburg) with the University Medical Centre of Hamburg-Eppendorf, the University of Music and Theatre, the Hamburg University of Applied Sciences, the HafenCity University Hamburg and the Hamburg University of Technology. Seven universities are private, like the Bucerius Law School and the Hamburg School of Business Administration. The city has also smaller private colleges and universities, including many religious and special-purpose institutions, such as the Helmut Schmidt University (formerly the University of the Federal Armed Forces Hamburg). Hamburg is home to one of the oldest international schools in Germany, the International School of Hamburg.